Coach Greg teaches "Fencing for Fitness" in the Community Interest Department of the Adult School program of the Fremont Union High School District (FUHSD). Fencing exercises all the body's muscles, while providing a fun way to relieve stress and aggression! (In 2005, Maestro John said, "The person behind the mask can be anybody you'd like them to be. You may be even with ten people at the end of the day — including the guy who gave you a parking ticket.") Train for strength, balance and aerobic exertion, all in one classic sport! A typical class session begins with footwork, progresses to drills, and ends in bouting. Beginning fencers use standard foils only. Intermediate and advanced fencers may use electric equipment and all three weapons. The 2019 "Q4" class session runs from April 3 through May 29, 2019. You can also register in person at the FUHSD Adult School office, or call the office at 408-522-2700. 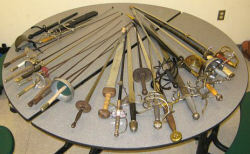 Each quarter, the beginning class kicks off with a brief history of fencing and a look at some fascinating, old-fashioned weapons. Then we progressively introduce the core footwork moves, point control and basic parries. Soon, we're on to the foil right-of-way rules and bouts! Often, the beginning class ends on an exciting note when students get to try electric scoring equipment for the first time. As in the beginning class, every intermediate/advanced session begins with a collective footwork warm-up. 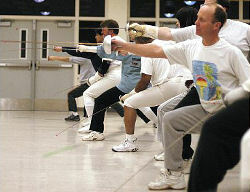 After footwork, many advanced fencers peel off for electric bouting, while the intermediate fencers study technique through drills. 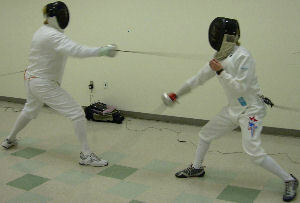 Toward the end of a session, the intermediate fencers may join the advanced group on the electric strips, or they may enjoy standard bouts, either directed or "round robin" style. Foil is our official instructional focus in all classes. But advanced fencers are often delighted to introduce intermediate fencers to the épée and saber (more opponents for them! ).